Neuroinflammation plays a vital role in Alzheimer’s disease and other neurodegenerative conditions. Microglia are the resident mononuclear immune cells of the central nervous system, and they play essential roles in the maintenance of homeostasis and responses to neuroinflammation. The orphan G-protein-coupled receptor 55 (GPR55) has been reported to modulate inflammation and is expressed in immune cells such as monocytes and microglia. However, its effects on neuroinflammation, mainly on the production of members of the arachidonic acid pathway in activated microglia, have not been elucidated in detail. In this present study, a series of coumarin derivatives, that exhibit GPR55 antagonism properties, were designed. The effects of these compounds on members of the arachidonic acid cascade were studied in lipopolysaccharide (LPS)-treated primary rat microglia using Western blot, qPCR, and ELISA. We demonstrate here that the various compounds with GPR55 antagonistic activities significantly inhibited the release of PGE2 in primary microglia. The inhibition of LPS-induced PGE2 release by the most potent candidate KIT 17 was partially dependent on reduced protein synthesis of mPGES-1 and COX-2. KIT 17 did not affect any key enzyme involved on the endocannabinoid system. We furthermore show that microglia expressed GPR55 and that a synthetic antagonist of the GPR receptor (ML193) demonstrated the same effect of the KIT 17 on the inhibition of PGE2. Our results suggest that KIT 17 is acting as an inverse agonist on GPR55 independent of the endocannabinoid system. 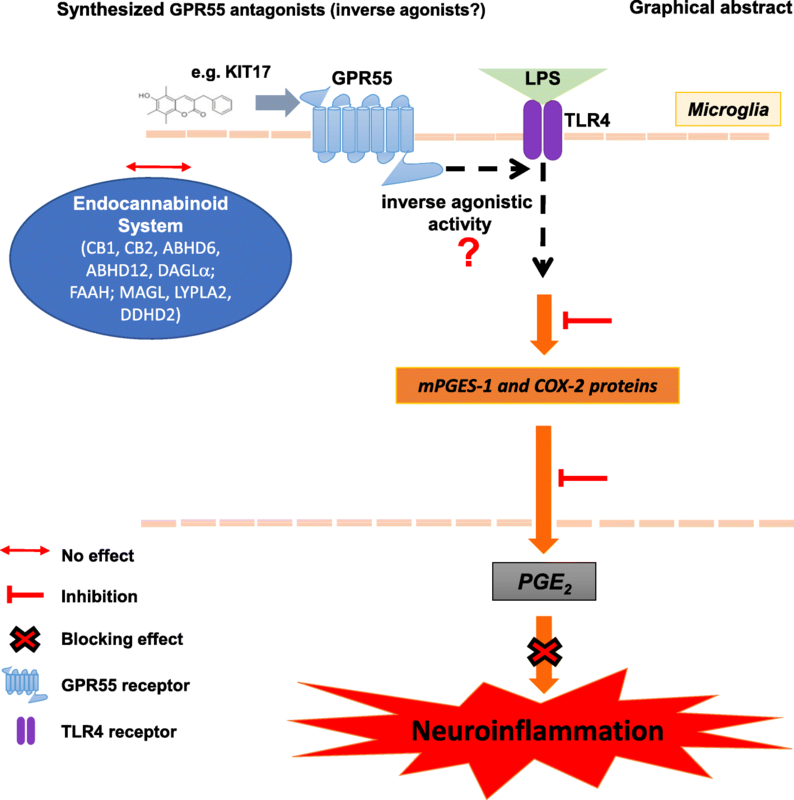 Targeting GPR55 might be a new therapeutic option to treat neurodegenerative diseases with a neuroinflammatory background such as Alzheimer’s disease, Parkinson, and multiple sclerosis (MS). For many years, neuroinflammation has been known as a common phenomenon in the pathology of many brain diseases. Microglia, the principal cells involved in the innate immune response in the central nervous system (CNS), play essential roles in the maintenance of homeostasis and responses to inflammatory stimulus [1–3]. The over-activated microglia has been associated with neurodegenerative diseases such as Alzheimer’s disease (AD), Parkinson disease (PD), and traumatic brain injury or aging [4, 5]. The GPR55 is an orphan G-protein-coupled receptor, first described by Sawzdargo et al. in 1999 , and it is not only highly expressed in CNS, but also in peripheral tissue . It can be activated by cannabinoids (CB) and non-CB, leading to the hypothesis that it might be a putative “type-3” cannabinoid receptor . However, in contrast to the cannabinoid receptors CB1 and CB2, GPR55 only couples to Gα12,13 proteins which leads to the activation of the ras homolog gene family member A (RhoA) and Rho-associated protein kinase (ROCK). The phospholipase C pathway is triggered by these proteins, which increase the intercellular Ca2+ and extracellular signal-regulated kinase (ERK) phosphorylation . GPR55 is expressed in immune cells, such as monocytes, natural killer (NK) cells , and microglia , and its involvement in inflammation has been reported [10, 12, 13]. 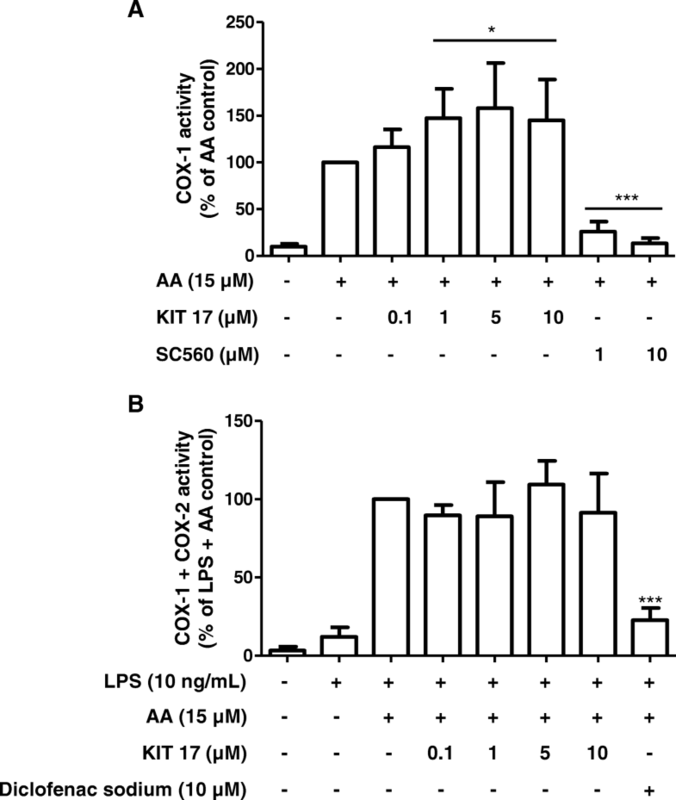 Activation of GPR55 by the agonist O-1602 increased pro-inflammatory cytokines and cell cytotoxicity in monocytes and NK cells stimulated with LPS . Corroborating with this, an antagonist of GPR55, CID16020046, and GPR55−/− knockout mice decreased the pro-inflammatory cytokines in colitis mice models comparable to human inflammatory bowel disease (IBD) . In hyperalgesia associated with inflammatory and neuropathic pain, it was observed to increase anti-inflammatory cytokines, IL-4 and IL-10, and also pro-inflammatory IFN-γ in GPR55−/− knockout mice . On the other hand, the GPR55 agonist O-1602 decreased IL-6 and TNF-α in a model of experimental acute pancreatitis . The roles of GPR55 in the pathophysiology of the CNS are still not clear. In an excitotoxicity in vitro model of rat organotypic hippocampal slice cultures (OHSC), the activation of GPR55 receptor by L-α-Lysophosphatidylinositol (LPI) mediated neuroprotection through microglia . In a mouse model of PD, the expression of GPR55 was downregulated in the striatum and the treatment with an agonist of GPR55, abnormal-cannabidiol, improved the motor behavior by neuroprotection of dopaminergic neuron cell bodies . A molecular, anatomical, electrophysiological, and behavioral study of GPR55−/− knockout mice demonstrated a normal development of brain structure and did not affect the endocannabinoid system nor muscle strength and motor learning. However, these mice presented deficits in motor coordination and thermal sensitivity . These studies suggest that GPR55 signaling can be involved in neurodegeneration and modulate certain cytokines and thus inflammation. However, its effects on neuroinflammation, especially on the production of members of the arachidonic acid pathway in activated microglia, have not been elucidated in detail. We therefore studied the effects of novel synthesized GPR55 antagonists in LPS-activated microglia by examining prostaglandin E2 (PGE2) production, COX/mPGES-1 mRNA, and protein levels. Furthermore, we evaluated the effect of KIT17 on key enzymes involved in the endocannabinoid system such as diacylglycerol lipase-α(DAGLα), monoacylglycerol lipase (MAGL), α,β-hydrolase domain-containing 6 and 12 (ABHD6 and ABHD12), and fatty acid amide hydrolase (FAAH). Animals were obtained from the Center for Experimental Models and Transgenic Services-Freiburg (CEMT-FR). All the experiments were approved and conducted according to the guidelines of the ethics committee of the University of Freiburg Medical School under protocol no. X-13/06A, and the study was carefully planned to minimize the number of animals used and their suffering. For the activity-based protein profiling (ABPP), the experiments were performed at Leiden University according to guidelines approved by the ethical committee of Leiden University (DEC#13191). Synthetic GPR55 antagonists (Fig. 1) were synthesized at the Institute for Organic Chemistry Karlsruhe - KIT (Karlsruhe, Germany)  and dissolved in DMSO. The number of the corresponding compounds in the Rempel et al. 2013 paper are: KIT3 is 14, KIT17 is 37, and KIT21 is 41. ML193 and O-1602 were obtained from Tocris Biosciences. LPS from Salmonella typhimurium (Sigma Aldrich, Deissenhofen, Germany) was resuspended in sterile phosphate-buffered saline (PBS, 5 mg/mL) as stock and subsequently used at a final concentration (10 ng/mL) in the cultures. As described in our previous studies [19–24], primary mixed glial cell cultures were prepared from cerebral cortices of 1-day neonatal Sprague-Dawley rats. Under sterile conditions, the brains were carefully taken, and the cerebral cortices were isolated and the meninges removed. Then, the cortices were gently dissociated and filtered through a 70-μm nylon cell strainer (BD biosciences, Heidelberg, Germany). After centrifugation at 1000 rpm for 10 min, cells were collected and resuspended in Dulbecco’s modified Eagle’s medium (DMEM) containing 10% fetal calf serum (Biochrom AG, Berlin, Germany) and antibiotics (40 U/mL penicillin and 40 μg/mL streptomycin, both from PAA Laboratories, Linz, Austria). Cells were cultured on 10-cm cell culture dishes (Falcon, Heidelberg, Germany) with density of 5 × 105 cells/mL in 10% CO2 at 37 °C (Heracell 240i, Thermo Scientific). After 12 days in vitro, floating microglia were harvested and re-seeded into 7 cm2 culture flask to give pure microglial cultures. On the next day, medium was changed to remove non-adherent cells, and after 1 h, the cells were stimulated for respective experiments. Cultured primary rat microglia were incubated with synthesized compounds (KITs) (0.1–25 μM) or commercial antagonist ML193 (10 μM) or agonist O-1602 (0.1–10 μM) for 30 min. Afterwards, the cells were treated with or without LPS (10 ng/mL) for the next 24 h. Supernatants were harvested and levels of PGE2 were measured using a commercially available enzyme immunoassay (EIA) kit (Assay Designs Inc., Ann Arbor, MI, USA; distributed by Biotrend, Cologne, Germany). The results were normalized to LPS and presented as percentage of change in PGE2 levels of at least three independent experiments. Viability of primary rat microglia after treatment with the synthesized compounds was measured by the CellTiter-Glo® Luminescent Cell Viability Assay (Promega), which is used to determine the number of metabolically active and viable cells in cell culture based on quantitation of the ATP present in the cells. Briefly, cells were cultured in 96 well plates at the density of 25 × 103 cells/well for 24 h. Then, the medium was changed and after at least 1 h, the cells were incubated with KIT 3, KIT 17, and KIT 21 for 24 h. The compounds were dissolved in DMSO, and DMSO was used in the negative control wells at final concentration of 0.15% and as a positive control in a higher concentration (10%) during experiments. The concentration of ATP was measured after 24 h of incubation by adding 100 μL of reconstituted substrate and incubating for 10 min. Luminescence was measured using a Modulus™ II Microplate Multimode Reader (Turner BioSystems, USA). Rat primary microglia were treated with KIT 17 (0.1–10 μM) and control for 30 min; then, the LPS (10 ng/mL) was added for 24 h. After the experiment, the cells were washed with cold PBS and lysed in the lysis buffer (42 mM Tris–HCl, 1.3% sodium dodecyl sulfate, 6.5% glycerin, 100-μM sodium orthovanadate, and 2% phosphatase and protease inhibitors). Protein concentration of the samples was measured using the bicinchoninic acid (BCA) protein assay kit (Thermo Fisher Scientific, Bonn, Germany) according to the manufacturer’s instructions. For Western blotting, 10–20 μg of total protein from each sample was subjected to sodium dodecyl sulfate-polyacrylamide gel electrophoresis (SDS-PAGE) under reducing conditions. Afterward, proteins were transferred onto polyvinylidene fluoride (PVDF) membranes (Merck Millipore, Darmstadt, Germany) by semi-dry blotting. After blocking with Roti-Block (Roth, Karlsruhe, Germany), membranes were incubated overnight with primary antibodies. Primary antibodies were goat anti-COX-2 (1:500; Santa Cruz Biotechnology, Heidelberg, Germany), rabbit anti-mPGES-1 (1:6000; Agrisera, Vännas, Sweden), and rabbit anti-actin (1:5000; Sigma Aldrich). The proteins were detected with horseradish peroxidase-coupled rabbit anti-goat IgG (Santa Cruz, 1:100,000 dilution) or goat anti-rabbit IgG (Amersham, 1:25,000 dilution) using enhanced chemiluminescence (ECL) reagents (GE Healthcare, Freiburg, Germany). Densitometric analysis was performed using ImageJ software (NIH, USA), and β-actin control was used to confirm equal sample loading and normalization of the data. Under unstimulated conditions, primary microglial cells only express the COX-1 isoform . To measure COX-1 activity, primary rat microglial cells were plated in 24-well cell culture plates. After 24 h, medium was removed and replaced with serum-free medium. KIT 17 (0.1–10 μM) or the selective reversible COX-1 inhibitor SC560 (1 and 10 μM) was added and left for 15 min. Then, 15 μM of arachidonic acid were supplemented for another 15 min. Supernatants were then collected and used for the determination of PGE2. To measure COX-2 activity, primary rat microglial cells were plated in 24-well cell culture plates and pre-incubated with LPS (10 ng/mL) for 24 h. Then, medium was removed and replaced with serum-free medium. KIT 17 (0.1–10 μM) or diclofenac sodium (preferential COX-2 inhibitor, 10 μM) was added and left for 15 min. Then, 15 μM of arachidonic acid was supplemented for another 15 min. Supernatants were then collected and used for determination of PGE2. The mouse brain proteome preparation and gel-based ABPP was performed as previously described [28, 29]. Mouse tissues were homogenized in lysis buffer A (20 mM HEPES pH 7.2, 2 mM DTT, 1 mM MgCl2, 25 U/mL Benzonase) and incubated for 5 min on ice. To remove containing debris, the suspension was low speed centrifuged (× 2500g, 3 min, 4 °C). The resulting supernatant was subjected to ultracentrifugation (× 100.000g, 45 min. 4 °C, Beckman Coulter, Type Ti70 rotor) to separate the membrane fraction as a pellet and the cytosolic fraction in the supernatant. The pellet was resuspended in storage buffer (20 mM HEPES pH 7.2, 2 mM DTT). The total protein concentration was determined with Quick Start Bradford assay (Bio-Rad). Membranes and supernatant were stored in small aliquots at − 80 °C until use. 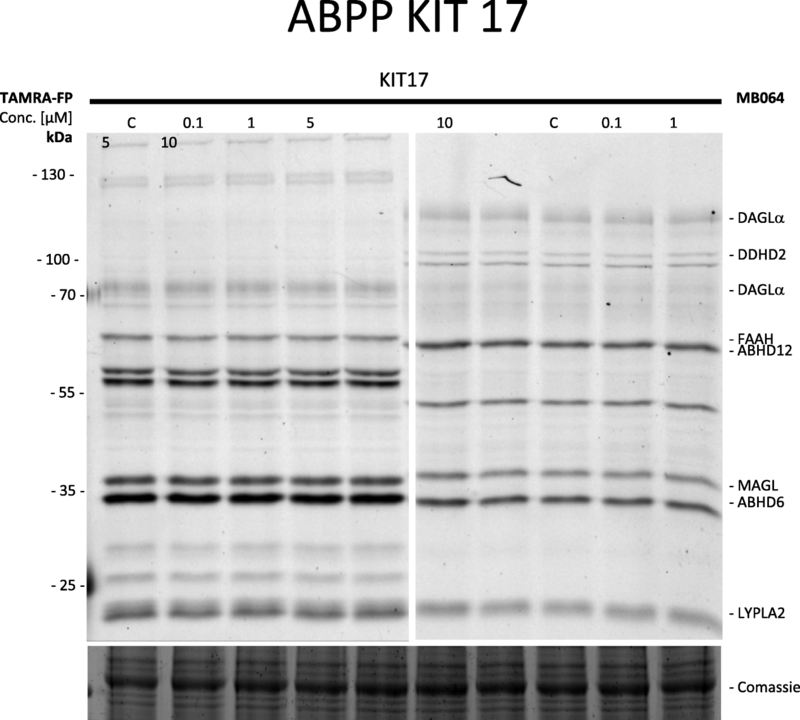 For the gel-based ABPP, mouse brain membrane proteome (2 mg/mL) were pre-incubated with 0.5 μL vehicle (DMSO) or 0.5 μL KIT 17 (in DMSO) for 30 min at room temperature. Followed by treatment with the activity-based probes tetramethylrodamine 5-carboxamdio fluorophosphonate (TAMRA-FP, 100 nM final concentration) and MB064 (250 nM final concentration) for 15 min at room temperature. The reactions were quenched by addition of 10 μL 3 × SDS-PAGE sample buffer, and the samples were directly loaded and resolved on SDS-PAGE gel (10% acrylamide). The gels were scanned with a Bio-Rad Chemidoc (Bio-Rad Laboratories B.V.) using settings for Cy3 and TAMRA (excitation wavelength 532 nm, emission wavelength 580 nm) and analyzed with ImageLab (5.2.1, Bio-Rad Laboratories B.V.). Statistical analyses were performed using Prism 5 software (GraphPad software Inc., San Diego, CA, USA). Values of all experiments were represented as mean ± SEM of at least three independent experiments. Raw values were converted to percentage and compared using one-way ANOVA with post hoc Student-Newman-Keuls test (multiple comparisons). The level of significance was consider as *p < 0.05, **p < 0.01, and ***p < 0.001. To prove that microglial cells express GPR55, we studied the mRNA levels of GPR55 in primary rat microglia with or without LPS stimulation. We observed the GPR55 mRNA is expressed in microglial cells and the stimulation with 10 ng/mL LPS did not affect the expression of this receptor (Additional file 1). We further investigated the effects of 21 chemical-related GPR55 receptor antagonists (KIT 1-KIT 21) on LPS-induced PGE2 synthesis in microglia cells. We selected some of the active KIT compounds, KIT 3, KIT 17, and KIT 21 (Fig. 1), from the first screening (Additional file 2) due to activity of 90–100% PGE2 inhibition and the availability of the compound for further studies. When treated with LPS, primary microglial cells produced robust amounts of PGE2 (2596.13 pg/mL, considered as 100%) compared to the untreated control (326.59 pg/mL) and this increase was inhibited by the three synthesized compounds (KIT 3, KIT 17, and KIT 21) in a concentration-dependent manner (Fig. 2). All three compounds tested, statistically, prevented the increase on levels of PGE2 at the concentrations of 10 and 25 μM. Furthermore, the KIT 17 (Fig. 2b) also statistically prevented at the concentration of 1 and 5 μM. We performed a cell viability assay to exclude the possibility that the inhibitory effects of the synthesized compounds observed were due to a reduction of cell viability. The effects of KIT 3, KIT 17, and KIT 21 on cell viability were studied using an ATP assay in primary microglial cells. The incubation with LPS or the compounds did not change cell viability compared to vehicle (DMSO) (Fig. 3). A significant increase in ATP was observed with the concentration of 10 μM KIT 3 (Fig. 3a) and 1 μM KIT 17 (Fig. 3b). DMSO in the high concentration of 10% was used as positive control, and it strongly affected cell viability of microglial cells (Fig. 3, right column). Since KIT 17 showed a desirable inhibitory profile on PGE2 release and had no negative impact on cell viability, even increased ATP levels, we used KIT 17 for the mechanistic follow-up experiments. We further investigate the effects of a commercial antagonist (ML193) and an agonist of GPR55 (O-1602) on PGE2 release in LPS-stimulated primary microglial cells. 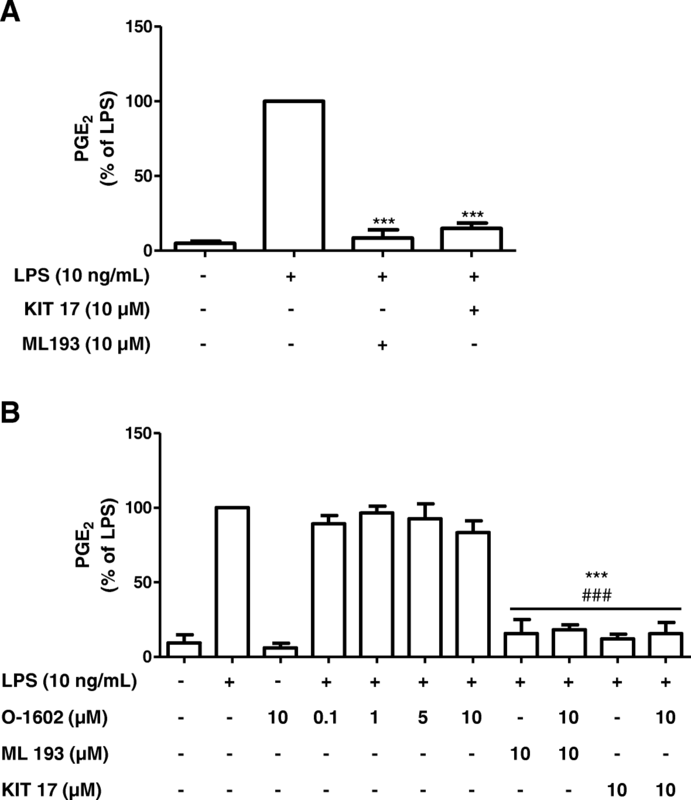 ML193 (10 μM) potently and statistically prevented LPS-induced increase of PGE2 levels by 90%, and a comparable inhibition was observed using KIT 17 (85% inhibition) (Fig. 4a). A potent agonist of GPR55, O-1602 (0.1–10 μM), did not affect the LPS-induced PGE2 release as well as did not interfere with the effects of ML193 and KIT 17. O-1602 also did not alter basal PGE2 levels (Fig. 4b). Our previous study demonstrated the effects of KITs compounds on GPR55, CB1, CB2, and GPR18 receptors , in which KIT 17 showed inhibitory effects on GPR55 and CB2 receptors. To investigate its involvement on other members the endocannabinoid system, we further evaluated the selectivity of KIT 17 on key enzymes involved in the endocannabinoid system [diacylglycerol lipase-αDAGLα, monoacylglycerol lipase (MAGL), α,β-hydrolase domain-containing 6 and 12 (ABHD6 and ABHD12), and fatty acid amide hydrolase (FAAH)]. To this end, we used the approach of gel-based activity-based protein profiling (ABPP) on a mouse membrane brain proteome. As shown in Fig. 5, we did not find any off-target interactions of KIT 17 in the concentrations of 0.1–10 μM. This indicates that KIT 17 showed a highly selective profile against GPR55 and CB2, as no significant reduction of any other endocannabinoid enzyme in the mouse brain proteome was observed in this experimental setting. Prostaglandins are synthesized through enzymes COX-2 and mPGES-1 under an inflammatory stimulus . As shown in Fig. 6, LPS induced the expression and the protein synthesis of COX-2 and mPGES-1. We observed that LPS-induced mPGES-1 synthesis was significantly inhibited by KIT 17 in a concentration-dependent manner starting at the concentration of 5 μM and revealing maximal effects using 10 μM, which decreased mPGES-1 levels about approx. 70%, if compared to LPS control (Fig. 6c). However, no effects were observed on mRNA expression of mPGES-1 at the 4-h time point (Fig. 6a). Furthermore, we investigated whether KIT 17 affected COX-2 mRNA expression and protein synthesis. The pre-treatment with KIT 17 in microglial cells showed a significant concentration-dependent decrease of LPS-induced COX-2 mRNA expression (Fig. 6b) and protein synthesis (Fig. 6d) starting at 1 μM and maximal effects using 10 μM, which decreased approximately 60% and 30% of COX-2 mRNA and 70% and 40% of protein levels, respectively, if compared to the LPS control. We also evaluated the effect of KIT 17 on COX-1 mRNA expression (Additional file 3) showing a downregulation of COX-1 mRNA expression by LPS stimulation and no modulatory effect of KIT17. Thus, we extended our study to investigate if these robust inhibitory effects of KIT 17 on PGE2 release were additionally due to a direct suppression of COX enzymatic activity. As shown in Fig. 7a, COX-1 activity was even increased by KIT 17 in the concentrations of 0.1–10 μM, whereas in COX-2 activity was not affected (Fig. 7b). The control inhibitors for COX-1 (SC560) and COX-2 (diclofenac) showed the expected inhibitory effects (last 2 columns on the right). Neuroinflammatory processes are considered a double-edged sword, having both protective and detrimental effects in the brain [31–33]. Microglia, the resident innate immune cells of the brain, are a key component of neuroinflammatory response. There is a growing interest in developing drugs to target microglia and control neuroinflammatory processes [34, 35]. We have developed a new series of GPR55 receptor antagonist compounds derived from the coumarin structure which, in general, exhibit a promising profile as GPR55 receptor ligands with antagonistic activity . In the current study, we demonstrated the anti-neuroinflammatory effect of these synthesized compounds in LPS-activated primary microglial cells by inhibiting PGE2 release and downregulating mPGES-1 and COX-2 protein levels. We furthermore show that microglia expressed GPR55 and that a synthetic antagonist of the GPR55 receptor (ML193) revealed comparable effects as KIT 17 on the inhibition of LPS-induced PGE2. Furthermore, we demonstrated that KIT 17 did not affect any enzyme involved in the endocannabinoid system in the mouse brain proteome. Monocytes and macrophages express an extensive repertoire of G-protein-coupled receptors (GPCRs) that regulate inflammation and immunity [11, 36]. Among these receptors, the role of GPR55 in the perspective of neurological diseases and in microglia activation is controversial. GPR55 is expressed in many mammalian tissues including several brain regions [6, 37]. Pietr et al. (2009) showed that GPR55 mRNA is significantly expressed in both, primary mouse microglia and the BV-2 mouse microglial cell line, and the stimulation with LPS downregulated GPR55 expression . However, in a study using primary rat microglial cells culture, the GPR55 transcript was detected in non-stimulated and LPS-stimulated cells, demonstrating no alterations of its levels . Collaborating with this finding, we were able to confirm the expression of GPR55 in primary rat microglia and that the stimulation with LPS did not affect the expression of the receptor. Further studies, probably using microglia cell lines, have to be performed to demonstrate the functional GPR55 receptors on microglial cells. We next studied the potential role of GPR55 in microglia-mediated neuroinflammation by studying the effects of the KIT compounds on prostaglandin synthesis. Microglial cells are the resident macrophages of the CNS and the most important source of PGE2 in neuroinflammation. As shown before, the stimulation of primary microglia with LPS strongly increases PGE2 and COX-2 expression [39–41]. The main finding of our study is that the various synthesized KIT compounds decreased PGE2 release in LPS-treated microglia and upstream members of the arachidonic acid pathway (COX-2/mPGES-1) without affecting the viability of microglia. Moreover, the similar inhibition of PGE2 was observed using the commercially available GPR55 antagonist ML193. Interestingly, the agonist O-1602 did not affect the inhibitory effect of ML193 as well as KIT 17 and also showed no effect on basal PGE2 levels when applied without LPS. KIT 17 and the other KIT compounds tested were synthesized by Rempel and collaborators (2013) as a series of coumarin derivatives (KITs) targeting GPR55 (formerly also known as CB3 receptor). However, the compounds, including KIT 17, also bind to other receptors such as CB1, CB2, and GPR18 receptors, suggesting that the observed activities of KIT 17 are possible mediated also by other receptors . The inhibitory values for KIT 17 on GPR55 is 9.32 ± 1.05 [IC50 (μM ± SEM)] but it also binds to CB2 [Ki ± SEM (μM) 3.42 ± 0.90], whereas only weak binding was observed for CB1 and GPR18 [Ki ± SEM (μM)/IC50 ≥ 10] . These data suggest that we can exclude CB1 and GPR18 as potential other receptors involved in the anti-inflammatory effects observed in microglial cells, but we cannot exclude an additional or exclusive involvement of CB2. 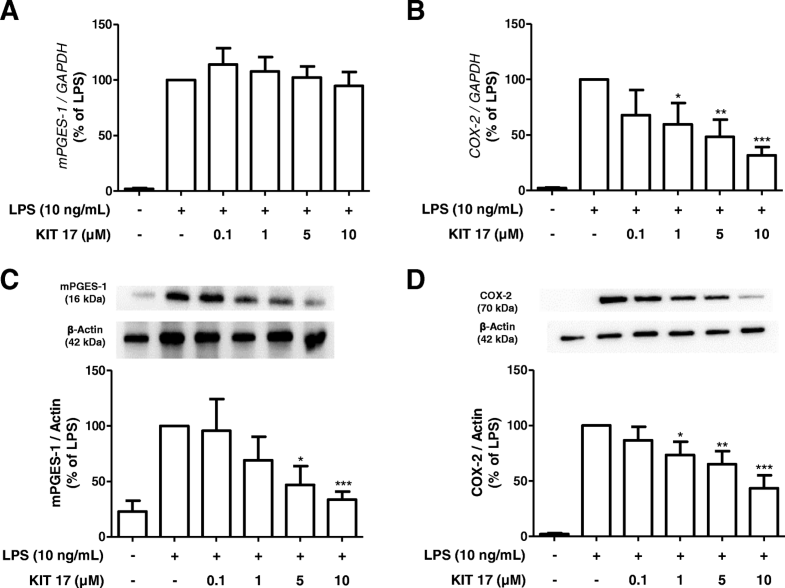 The fact that KIT 17 as a GPR55 or CB2 antagonist is inhibiting TLR4-mediated inflammation, suggests an inverse agonistic activity of KIT 17 on GPR55 or CB2. To confirm this hypothesis and to prove a possible involvement of CB2, we used AM630, a compound with CB2 inverse agonistic activity with a Ki of 32 nM , also showing antagonistic activities on CB2. As shown in Additional file 4, AM630 also inhibited LPS-induced PGE2 release in a comparable inhibitory profile on LPS-induced PGE2 as KIT 17 with a slight more activity using 1 μM. However, the Ki of AM630 (32 nM) is 100 fold lower towards CB2 then the one of KIT 17 (3.42 μM on CB2), implicating a more potent effect of AM630 on PGE2 release induced by LPS then KIT 17, if we assume a CB2-mediated effect. Since the inhibitory activity of AM630 on LPS-induced PGE2 release is only marginally higher than the effect of KIT 17, we conclude that CB2 is most likely not mediating the effects of KIT 17 and that AM630 might even also act via GPR55 on the observed effects. More studies have to be performed to support this conclusion, since there are to our knowledge no data available on the effects of AM630 on GPR55. Since the GPR55 is described to be linked to the endocannabinoid system and due to the fact that the KIT compounds are also binding to CB1 and CB2, we were further interested in other interactions between KIT 17 and other members of the endocannabinoid system. Using the activity-based protein profiling on mouse brain proteome for selectivity and off-target activity approach, we did not find any interactions between KIT 17 and the endocannabinoid enzymes DAGLα, MAGL, ABHD6, ABHD12, and FAAH. An interaction or effects of GPR55 activation on these enzymes have not been described to our knowledge in the literature yet. Thus, our data strongly suggest that PGE2 inhibitory effects in are most likely mediated by GPR55, although other mechanism independent of GPR55 and CBs in the observed effects cannot be excluded. The involvement of GPR55 in the activation of the arachidonic acid cascade during microglia activation and neuroinflammation has not been reported yet. The potential role in peripheral inflammation has been studied with GPR55 antagonists or knockout mice. The GPR55 inhibitor CID16020046 reduced TNF-α, IL-1β, IL-6, and COX-2 levels in a mouse model of intestinal inflammation . In a mouse model of colorectal cancer, the levels of COX-2 and PGF2α were decreased in GPR55−/− . In hyperalgesia associated with inflammatory and neuropathic pain, an increase of anti-inflammatory cytokines, IL-4, and IL-10 has been observed in GPR55−/− knockout mice . These data also suggest that GPR55 might be the mediator of the anti-neuroinflammatory effects of KIT17 as observed in this study. In accordance with the diverse and complex pharmacology of GPR55, no data yet existed regarding the efficacy of GPR55 antagonists on COX-1/2 activity. Thus, we elucidated whether the robust inhibitory effects of KIT 17 on LPS-induced PGE2 release is due to a direct inhibition of COX enzymatic activity, the mechanism of action of most NSAIDs. We demonstrate here, that COX-1 activity was increased by KIT 17 in the doses of 1–25 μM, whereas in COX-2 activity was not affected. The control inhibitors for COX-1 (SC560) and COX-2 (diclofenac) showed the expected inhibitory effects. This suggests that the PGE2 inhibiting effects of KIT 17 and most likely by the other KIT compounds is not due a direct inhibition of COX activity. The COX-1 inducing effects might even have positive benefits, since COX-1 is protecting the gut mucosa and its inhibition by some NSAIDs cause gastro-intestinal side effects [44, 45]. As illustrated in the graphical abstract (Fig. 8), we provide the evidence that KIT 17 and the other KIT coumarin derivates and GPR55 antagonists effectively block microglia activation in terms of attenuation of both PGE2 production and mPGES-1/COX-2 levels. Our data provide evidence that the anti-neuroinflammatory effects are mainly mediated by GPR55, most likely via an inverse agonistic activity. However, further experiments are necessary to better comprehend the mechanistic effects of KIT compounds and the involvement of GPR55 receptors. Our study suggests that GPR55 antagonists might be a new therapeutic option for the treatment of neuroinflammation-, neurodegeneration-, and neuroinflammation-related diseases. TH, NV, and SB designed and synthesized the GPR55 antagonists. HJ, AK, and BLF participated in research design. The experiments were performed by HJ, AK, and FM. Data were analyzed by SWS, HJ, TH, NV, AK, and FM. SWS, BG, TH, NV, SB, FM, MVDS, and BLF wrote or contributed to the writing of the manuscript. In addition, SWS, HJ, BG, AK, TH, NV, SB, FM, MVDS, and BLF reviewed the data and discussed the manuscript. All authors have read and approved the final version of the manuscript. All the experiments were approved and conducted according to the guidelines of the ethics committee of the University of Freiburg Medical School under protocol Nr. X-13/06A. For the activity-based protein profiling (ABPP), the experiments were performed at Leiden University according to guidelines approved by the ethical committee of Leiden University (DEC#13191).